I recently went to an old school reunion meeting friends I haven’t seen since I was sixteen years old. Quite scary where the time goes! It was a lovely evening involving much reminiscing of memories from those old school days; sharing our personal journeys and much laughter and camaraderie. It was a special meeting to go back and see all those people who I had shared a significant part of my growing up with. We hope to do it again. Interestingly, a few days after the reunion, I found myself feeling a bit unattractive, down and awkward. These days, I don’t often feel like this. I wholeheartedly believe in authenticity and it is part of my life to practice self-acceptance and all the things that I constantly talk about in this blog. I was a bit confused. What was going here? On reflection, I realised that this was nothing to do with the specific event per se. This was about how I used to feel about myself when I was at secondary school, all those years ago. And it wasn’t that great to be reminded. Up until the age of sixteen, I was fortunate enough to have a fairly healthy relationship with food and my body. Food was fuel; pleasure and something I didn’t think about; a bit like breathing. 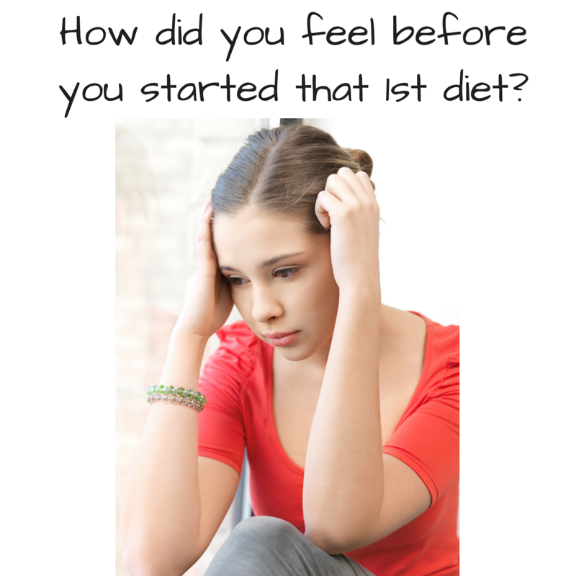 I realise though, that my self-esteem was quite shaky and particularly in the time period leading up to my first diet. At school, it felt as though prettiness; confidence; ease with boys and being cool were all the praised qualities to make you popular and attractive to others. Back then, I desperately wanted to be liked and accepted and I didn’t feel I had any of those popularity factors. I felt quite boring and ordinary; a goody two shoes who actually quite liked working. I was scared of boys; and felt awkward and shy. I was completely not cool at all, not helped by the fact of having strict parents who would not allow me out the house with the attire that my peers wore daily. I felt so different from the people I wanted to be like. I felt as though I didn’t really fit in at all. What was wrong with me I thought? At school, I wasn’t actually disliked or bullied. I had friends and to an extent enjoyed aspects of it, but I did feel insignificant and unnoticed in my year group. I had real feelings of not being good enough. Don’t get me wrong, I wouldn’t apportion blame to school here. Various factors from my early childhood had contributed to me wanting to fit in; please and be liked by others rather than getting to know who I was. I placed far too much value on the outside world, rather than my inner one. So, what did I do? I tried to solve the problem of feeling better about myself by going on a diet and getting thinner. The irony was that I didn’t even need to. I was slim already. Looking back, if I am honest, I felt unattractively slimmer. Others had curves and happily showed them off. As a late developer, I felt quite childlike and immature in comparison. I wasn’t comfortable with my body. I have been fortunate, and after I left school and had other experiences with sixth form; travel; living away from home and university, I started to find my feet and gain confidence albeit slowly. I began to develop a sense of my own identity and self-worth. Overtime, I found my own place of fitting into the world and feeling worthy, loveable and accepted most importantly by myself, but then naturally, this followed with an ability to then form closer real connections with others. So often, as I did, you may get caught in the trap of thinking that getting the right body is going to change everything. Actually, so often, what you are really seeking is significance, feeling valued, a sense of importance, being liked and feeling accepted. Changing your body can temporarily give a little glimmer of all the things you may be looking for and might provide a focus away from other insecurities. Others may comment on your weight loss or display envy about body shape or praise you on aspects of your appearance. Inside though, it is unlikely to change your feelings of self-worth. You might even feel trapped in holding on to your controlled body shape to be accepted and approved of by others. It can become part of your identity which can then be hard to let go of. 1. Look back in your past. Recognise when you first felt like this. What was going on for you then? For me, it was a gradual accumulation of not feeling good about myself since late primary school, but this was certainly amplified around the mid-teenage years when I felt intense pressure to fit in and be liked; this also being accompanied by stressful life events. 2. Every-day, aim to live by your own values and focus on what is important to you rather than always looking outside for validation or acceptance. You may be surprised to notice what is really important to you, when you start to listen to your own voice. 3. Lavish yourself daily with self-care and self-validation. This is not about being arrogant but practising real self-acceptance. 4. When you get knocked off track and feel ‘not good enough’, understand your triggers and learn to manage them. Try not to allow these feelings of inferiority, upset, anxiety or doom to overwhelm you. Learn to pick yourself up again and realise that the strength of these feelings may belong in the past, rather than in the present moment. If this feels impossible to manage alone, be brave and seek out further support. 5. Always aim to be kind and compassionate to yourself. Feel warmth and empathy for your younger self and think about what she or he really needed back then. Try not to judge or criticise. Accepting your vulnerable self, warts and all can feel strangely liberating. There is no need to hide anymore and you can finally be you, and just get on with living. If you feel that my approach might work for you and you would like to get in touch about working with me to explore some of these issues further, I would love to hear from you. I am now working from Portugal Place in Cambridge and Harley Street, London. I also offer Skype and telephone support. I am passionate about helping you to eat all the foods you love; and feel great about your body without disordered eating or dieting.